If you’re looking for effective gutter covers to keep debris out of your gutter system, call on the guttering specialists at ABC Seamless of Albuquerque, New Mexico. We have faithfully assisted homeowners in the region since 1989 by providing quality gutter guards that virtually eliminate the need to ever again climb a ladder and clear their downspouts. What’s more, our gutter protection systems are designed to fit most any kind of gutter, and hold tight even in the face of strong winds. With gutter covers from ABC Seamless of Albuquerque, you’ll enjoy years of maintenance-free gutter performance. What’s more, gutter covers prevent animals from nesting in your gutters, which can create even more formidable blockages that prevent water from flowing freely off your roof, through the downspouts, and safely away from your home’s foundation. Water that does not drain properly can seep into your roofing underlayment, rotting the wood and causing extensive damage. 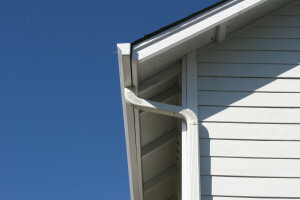 Stagnant water in your gutters can also become a breeding ground for insects and other pests. To learn more about our gutter covers and how they can save you from cleaning your gutters every year, call ABC Seamless of Albuquerque, NM. Be sure to ask about our incomparable seamless designer gutters, which can offer an extraordinary level of protection from water damage for your home.